This great zucchini dish was created one day after I strolled into my kitchen with yet another armful of zucchini from our garden. I seriously thought of hiding them so I wouldn’t have to deal with yet more zucchini, but my conscience got the better of me and I tossed them into the sink for a quick wash. I decided quickly that I wanted to make a simple side dish to go along with our grilled veal that evening, but didn’t want to fuss as it was simply too warm. I sliced my zucchini into rounds, tossed them into a large bowl with a few ingredients, poured everything into a casserole dish, and then popped the zucchini into the oven. Ten minutes before the zucchini were finished cooking, I sprinkled them with some cheesy homemade breadcrumbs (see below), and then baked the dish until it was golden brown and crispy. Surprisingly, it turned out to be one of my favorite zucchini recipes I have made in years, and I have made a lot of them! Homemade breadcrumbs are so much better than store bought ones and can be made with all your leftover bread. When my bread starts to become stale, I simply cut it into small cubes and freeze in ziplock bags until needed. I can use even the frozen bread cubes to make great breadcrumbs in my food processor in minutes. If you cannot find canned cherry tomatoes, then any chopped Italian tomato will work but the sweetness of the cherry tomatoes is delicious. Summer squash such as zucchini is a good source of vitamins A, C, as well as fiber. Day old whole wheat bread cubes are used to make healthier breadcrumbs. 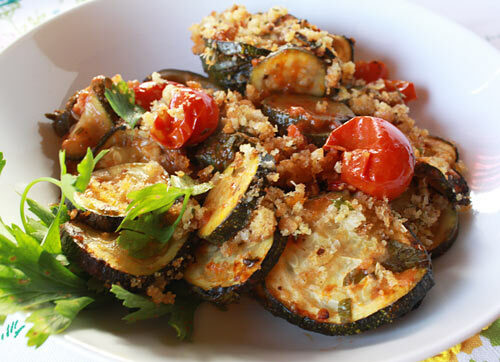 A healthy baked zucchini dish with a crisp, golden topping. Remove top and tail from zucchini and slice into thin rounds, and then place into a mixing bowl with the rest of the ingredients excluding the breadcrumbs and mix well with your hands. Pour the zucchini mixture into an oven-proof casserole dish large enough to hold everything, cover, and bake for about 30 minutes or until the zucchini are fork tender. While the zucchini are baking, place the bread cubes in a food processor and pulse until they become coarse crumbs. Add the chile pepper, lemon, cheese, salt and pepper and pulse until well mixed but still coarse. 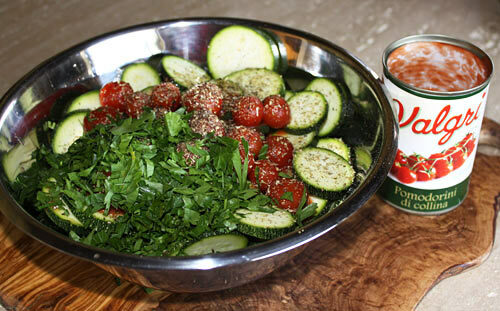 Add the parsley and olive oil and pulse once more just until the parsley is chopped. Uncover the zucchini and sprinkle the breadcrumbs over the top. Return the casserole to the oven without a cover and bake an additional 15 minutes or until the top is crisp and brown.